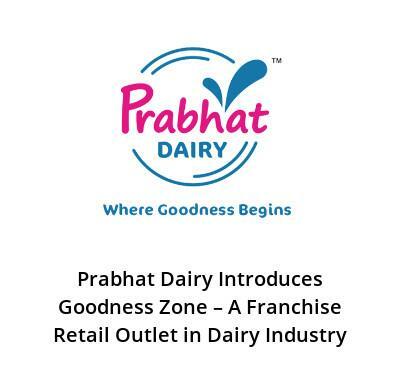 Mr. Vivek Nirmal, the Managing Director of Prabhat Dairy has planned to utilize milk based products like - buttermilk and milkshakes in support of selling them across the retail sector through the launch of its first retail store franchise - Goodness Zone. Prabhat Dairy is in talks to bring into service 500 franchise-based retail outlets within the next three years as plans are well underway to cover the entire city of Maharashtra. With over 40,000 traders in Maharashtra, Prabhat Dairy plans to choose franchises that have the required real estate and readiness to capitalise ₹4 lakh in the industry. Prabhat Dairy is willing to invest ₹80,000 for coming up with the interiors and for the provision of cooling solutions in each outlet. Having set aside ₹30 crore for the marketing and awareness initiative around Goodness Zone, Mr. Vivek Nirmal said, “From ₹400 crore we are aiming to increase our retail business revenue up to ₹1,000 crore within the next two years”. Places were milk is sold over 4,000 litres is targeted by the company in order to setup the Goodness Zone franchises. Subjugated by top brands, the ₹30,000-crore dairy beverage market is rising at an astonishing rate of 23% and is assured to triple in terms of profit as many individuals have begun to prefer healthy alternatives over aerated drinks. The apt quality and pricing is a must in order to make the milk-based products, more demandable is what the Chief Marketing Officer, Mr. Nidhi Nirmal said.